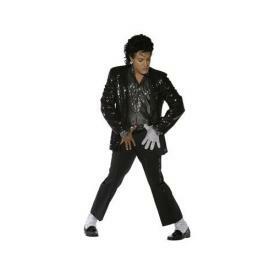 My Family Fun - Michael Jackson Billie Jean Costume Put on this jacket and shine like a superstar. Put on this jacket and shine like a superstar. Includes Deluxe Jacket, Shirt, Pants and Socks. Available in Adult Mens sizes Medium and Large. Wig, Glove and Shoes not included. This is an officially licensed Michael Jackson Costume.